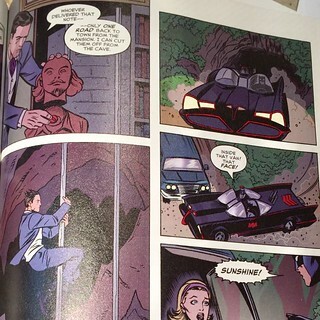 The 2004-2006 “Solo” series from DC Comics included a Michael Allred issue, with a “Batman ‘66” tale, “Batman a-Go-Go”! (There is also a 2013 hardcover omnibus, featuring Adam West’s Batman doing the Batusi.) Here’s a cameo of Shakespeare’s head and the 60s Batcave entrance!